The VS+ Visually Evoked Potential (VEP) system uses world-leading science developed by the Save Sight Institute at the University of Sydney, producing superior measurement accuracy and repeatability. The system consists of sophisticated but easy to use software controlling a proprietary bio amplifier specifically designed for making both full field and multi-focal VEP recordings. 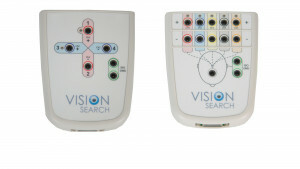 The VS+ System provides objective amplitude and latency responses for up to 56 separate segments of visual field. CE Mark for the EU. Inclusion on the Australian Register of Therapeutic Goods (ARTG). Currently submitting for regulatory clearance in other key work markets, such as US FDA . Please check our website for updates on the VS+ regulatory approvals. 56 segment multifocal recording with trace improvements and noise scores between runs. 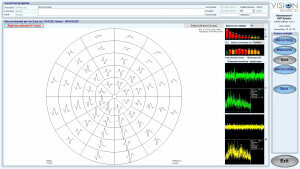 Full field recording with fully customizable options: frequency, sequence length, check size, check colors, geometry (half, quarter, inner/outer circle). Four patient focus games with variable difficulty, which are played in the center of the screen and keep the patient fixated with minimal muscle movements. 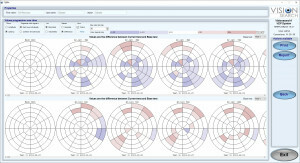 Ability to view recordings, including eye comparison (asymmetry) and modify best channel selection and waveform peak positions. 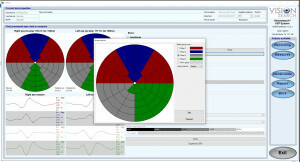 Ability to create or compare to reference sets such as normals patients, including advanced correlation-based latency comparisons (as opposed to simple peak comparisons). Ability to export all data including trace waveforms in native, graphical or .csv format (for analysis in 3rd party packages). Standard electrode wiring interfaces for both mfVEP and ffVEP, as well as a ‘research’ mode for custom wiring. See figure 1. Professional SQL database and crash-recovery features (e.g. ability to directly continue interrupted tests in case of a power outage). Simple on-site setup which can be performed by any local technician. “Stand alone” software that can be installed on any PC for viewing and analyzing recordings without needing physical access to the system. All consumables supplied for instant clinical use. 12 months’ warranty with immediate resolution. On-site installation and comprehensive training by qualified Visionsearch staff. Operator support by phone or online (technical support included in warranty). High performance Laptop (SSD, NVidia graphics). Custom Bio-Amplifier with easy to wire interface and real-time skin impedance indicators next to the electrode sockets. See figure 1. Patient feedback game controller to assist in maintaining focus through simple games in the center of the screen. Medical grade silicone electrode crosses and electrode holders. Head positioning distancer with medical grade silicone patient head rest. Ophthalmology table with electric height adjustment, patient monitor arm, and lockable wheels for easy relocation. Suitable for 110/220/240 volt, 50-60 Hz power. Sector analysis: group segments into sectors, including via custom groupings. 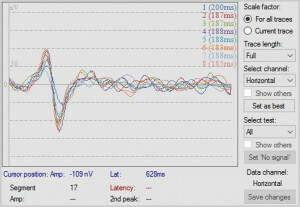 Progression analysis: a powerful tool for analyzing a patient’s progress in amplitude, latency over time, including same channel/same peak logic and signal correlation based latency comparison. Progression can be viewed based on absolute values, in comparison to a baseline test or in terms of asymmetry between eyes. Reporting: generate custom reports based on templates, including the ability to iterate through sub-data (e.g. tests, segments). Recalculate tool: re-process a recording with non-standard parameters (e.g. noise thresholds, analysis intervals, averaging coefficients) for research purposes.